I have been growing more interested in genomics, so this quarter I took a class on new techniques in genomics. * What I learned is that the most important aspect of modern genomics is cost. Sequencing gets exponentially cheaper every year, which makes answering old questions less expensive, and opens up new experimental possibilities. For example for cancer, in the past doctors might have genotyped a tumor once, while doctors now can sequence tumors in real time to identify drug resistance. * If you miss the days of scientific tables, I suggest you check out the supplement of any genomics paper. So how can genomics be useful for neuroscience? Sequencing is most famously used on DNA, but can be used on RNA too (RNA-seq). This makes it possible to characterize transcriptomes using sequencing rather than use microarrays. Recently, with cost reductions and new techniques, this has enabled single neuron transcriptomics. If you believe than a neuron’s mRNA and proteins define it, this means we can characterize single neurons with RNA-seq, then look at populations of neurons to figure out how neurons can be grouped into cell types. So today I'd like to write about what cell specificity is, review two papers on single neuron transcriptomics, and the implications that this has on how systems neuroscience looks at cell-specific circuits. What is a cell type? The brain is composed of billions of neurons, each of which do something different, but many of which do something similar. Given that protein expression determines what a cell does, I would define a theoretical "cell type" as a group of cells that express a similar set of proteins and encodes a similar type of information. (I say "similar type of information" since neurons of the same type could encode different versions of the same information. For example, I would say all direction selective retinal ganglion cells are the same cell type whether they encode up or down movement. If different directions express different proteins, then that would change things (which I believe may actually be true)). While that is a simple theoretical definition of a cell type, there is also the issue of how we deal with cell types in practice. Right now, the most popular way to approach cell-type specificity is transgenic mice (while I poked fun at Nature titles last month, a majority of them were about specific circuits controlling behaviour). To understand how cell-type specificity is done, it would be useful to have an example, so let's look at how Haubensak et. al. in David Anderson's lab did it. Haubensak et al were interested in the central amygdala, which is involved in conditioned fear. To find genes specific to the central amygdala, they performed a microarray analysis on the transcripts from the brain region (today, people would probably scour the Allen Brain Atlas). This analysis yielded a few candidate genes like PKC-delta, CRH, and enkaphalin. Once they had their candidate genes, they performed immunohistochemistry and patching to characterize the cells' expression patterns and electrical properties. When they were satisfied that PKC-delta neurons were interesting, they injected viruses containing ChR2 into the central amygdala of PKC-delta-Cre mice, and performed their main fear conditioning experiments. This illustrates the functional definition of neuron types today: Cre-driver lines with viruses injected in a specific location. This functional definition of a cell type is incomplete a number of ways. It ignores that multiple types of cells in a given region could express the same gene; that is, there could be two types of cells that express PKC-delta. It also ignores that gene expression changes during development (this is partially overcome by the temporal precision of viruses). And it ignores the importance of that gene for the function of the cell. Examples of cell types in arcuate nucelus as determined by neurotransmitter. The set of neurons expressing GABA includes three different subsets of neurons, an example of how GABA and glutamate are poor cell markers. Moving farther from the synapse, many interneurons can be identified by the types of calcium binding proteins they express (e.g. calretinin vs calcitonin). Given how important calcium regulation is, these cells might have different firing properties, and be functionally different. Even farther from the synapse, you can identify cells by secondary messengers like PKC-delta. To be honest, though, without a clear link between secondary messengers and actual function, I am skeptical whether they can truly be cell specific markers. Besides identifying cell types based on their transcripts, you can subdivide cells based on the projection patterns as well. For example, the AgRP set pictured above is actually composed of multiple groups of cells the project independently to different brain areas. At the moment, our ability to identify and manipulate cell types is lacking. We use brain atlases and microarrays to identify populations of cells, but don't really know the boundaries of each cell type. So how can we define them better? My favourite answer is single neuron transcriptomics. The basic idea is that you can isolate the mRNA from a single neuron, amplify it via PCR, and then sequence it; this would give you a quantitative assessment of all the RNA that a single cell expresses. You then repeat this process on dozens or hundreds of cells chosen at random, and use clustering algorithms to see which cells have similar expression profiles, which would constitute a defined cell type. A paper came out in Nature Biotechnology this year which illustrates the process in developing human cortex. They took tissue, dissociated it, and isolated individual cells using microfluidics. Once single cells were isolated in their little compartments, they were able to perform all the steps outlined above: lysation, amplification, and sequencing. 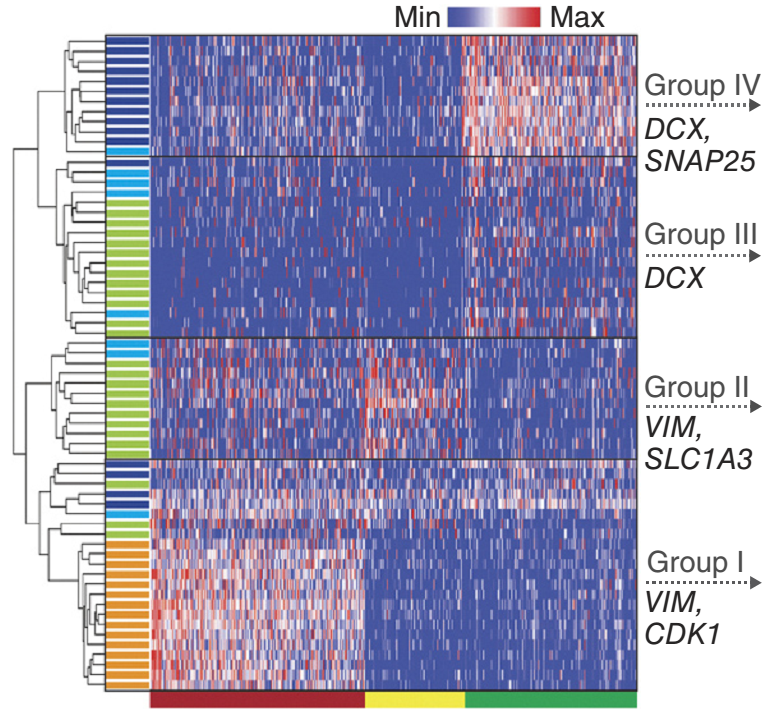 Clustering of cells based on single-cell transcripts. On the x-axis are individual genes. On the y-axis are individual neurons. The color of each rectangle is the gene expression in the cell. Neurons could be clustered into 4 groups. Some groups, like group 1, could be further subdivided. Once they quantified expression for all the mRNA, they performed PCA to identify the most informative genes; then hierarchical clustering of cells using the 500 most PCA-loaded genes. Following clustering, they identified four major groups of neurons that corresponded to cells at different stages of cell division (see above). They were furthermore able to subdivide these clusters, like group 1, into smaller subsets at different stages of differentiation. Using this technique they found that two transcription factors, Egr1, and Fos, were more important in development and differentiation than previously realized. While cell sorting is a great technique for developing cells, it is less useful for mature neurons which send neurites everywhere; if you were to try to shove a neuron in a cell sorting tube, you would rip off the axons and dendrites, and leak mRNA everywhere. To do single cell transcriptomics in adult neurons, James Eberwine's lab at UPenn developed a method they call TIVA (see figure below). How TIVA works. 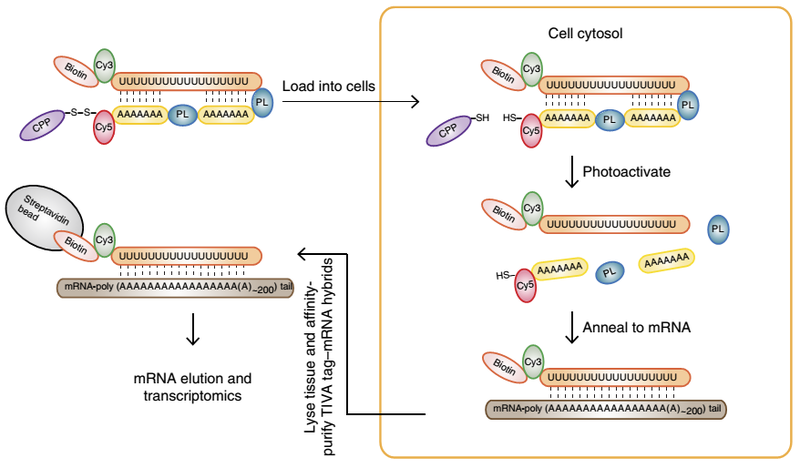 "The TIVA tag is composed of several functional groups: biotin, Cy3, poly(A) tail binding 2′-F RNA poly(U) oligo (orange), photocleavable linker (PL), 2′-OMe RNA poly(A) oligo (yellow), Cy5, disulfide bond (S-S) and CPP." 1.) The CPP tag on TIVA allows it to penetrate cells; once TIVA is in the cytosol, CPP is cleaved. You can see which cells have taken up TIVA by monitoring Cy5 fluorescence while exciting Cy3 (Cy3/Cy5 is a FRET pair). 2.) To release the RNA binding sequence, shine light on a single cell, cleaving the PL linker. You can monitor this via the Cy3/Cy5 fluorescence ratio. 3) Once released, TIVA will bind to the polyA tails of mRNA. 4) You lyse the cell, then extract TIVA and associated mRNA via the biotin tag. They first verified that TIVA worked in cultures before turning to hippocampal slices. In slices they bath applied TIVA, and monitored its uptake in cells. (panel b, below). They then photocleaved the construct in a single cell (cell ii), and verified the cleavage using fluorescence (panel c, right). Finally, they sucked up the tissue in a pipette, extracted the cell, and sequenced. Using sequencing they were able to verify that they were sequencing neurons, as opposed to the surrounding tissue (panel d). Single neuron sequencing in hippocampal slices. TIVA, as presented in the paper, has a couple major downsides. First, it cannot be targeted to specific cell populations. This means that you would have to profile all the cells in a given region, rather than specific subsets your are interested in. If there are many small populations in a given area, identifying them would require large sample sizes. Second, the throughput for the technique appears to be one neuron per hemisphere; in the paper they sequenced on the order of tens of neurons. If you wanted to phenotype one hundred cells in a brain region, you would have to sacrifice fifty mice, which is a hefty burden. On the positive side, once you characterize a brain, you won't have to profile the region again. Whatever the current caveats, I think single cell transcriptomics is the future. It will allow us to accurately profile cells entire transcriptome, and cluster then to truly identify cells that have similar identities. So what does this mean for you (or me), dear neuroscientist? First, I would bet that whatever cell type you (or I) are working on is not actually a single homogenous cell type, but probably composed of multiple cell types. This should not stop you from doing experiments, since the experiments of today are always superseded by tomorrow; but if you encounter ambiguous results, this is likely one source. Two, intersectional methods are going to be essential going forward. 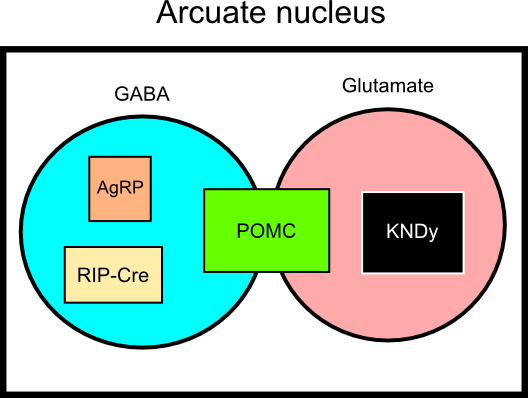 For example, the POMC neurons shown in the first figure can release glutamate, GABA, or neither. If you truly want to understand the subsets of POMC neurons, you would need to use cell lines specific for POMC and glutamate, and viruses that could recognize the combination. Experiments like this will certainly require more breeding, but will give a more precise answer. There is probably a nice faculty position for whoever can come up with an easy intersectional transgenic model. 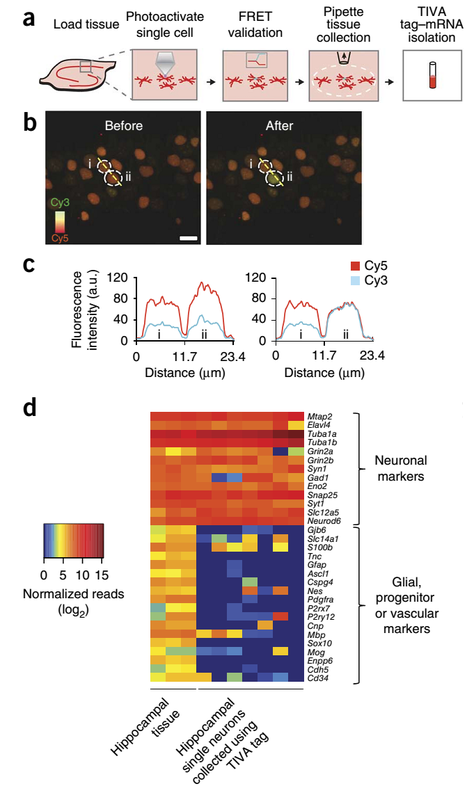 Third, the future is nigh.There are grants on RePORTER using single-cell transcriptomics to characterize prefrontal cortex, retina and zebrafish, and the dorsomedial hypothalamus. Just in the couple of weeks I was mulling this blog post, a paper in Nature Neuroscience came out characterizing dorsal root ganglion cells. If you want to Better Know a Cell Type, now is probably the time to act. Tl;dr: If you're a systems neuroscientist who hasn't kept abreast of genomics, just remember: single-cell transcriptomics is getting cheaper by the month, and is going to redefine our understanding of cell types in the next few years.